Henry Holt and Co. (BYR), 9781627790826, 32pp. 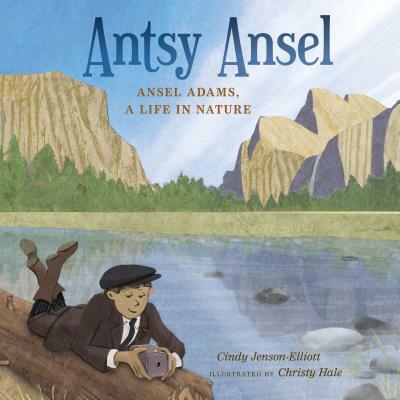 From his early days in San Francisco to the height of his glory nationwide, Antsy Ansel chronicles a restless boy's path to becoming an iconic nature photographer. Cindy Jenson-Elliott is the author of many books for young readers, including the celebrated Weeds Find a Way illustrated by Carolyn Fisher. She is a freelance writer for a variety of newspapers, magazines, and educational publishers, as well as a teacher and natural history instructor. She lives in San Diego, California, with her family. CHRISTY HALE has illustrated many picture books and is also the author of The East-West House. She lives in Palo Alto, California, with her husband and their daughter. “In an era of hyper-medication for hyper kids, Ansel Adams is a role model for hyper kids. This fine book tells the true story of how one boy who couldn’t sit still found his joy and his calling outdoors in the natural world. Mountains, streams and backyards aren’t a panacea, but for many kids, they can make all the difference. How any other children, like antsy Ansel, might give us great gifts in the future, if we give them the gift of nature today?” — Richard Louv, author of “Last Child in the Woods: Saving Our Children from Nature-Deficit Disorder” and “Vitamin N"